"Watch Carefully How You Live"
Watch carefully how you live, not as foolish persons but as wise, making the most of the opportunity. Here are the young preachers who preached at today's preaching festival. The one on the far left is a 15 year old Baptist. The one to her left is a Christian and blind. The others were various denominations: United Methodist, non-denominational, Assemblies of God and Episcopal. The 15 year old blind preacher was truly amazing for her age. I was the "sermon evaluator" for the two below. Both did excellent jobs. I gave the closing homily at the dinner. 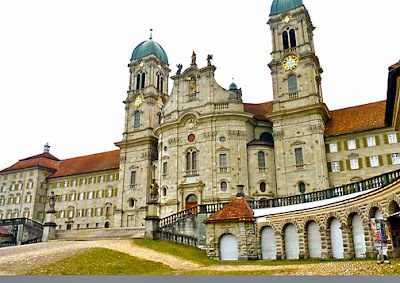 Saint Meinrad Archabbey in Indiana is named after the mother abbey in Einsiedeln, Switzerland. 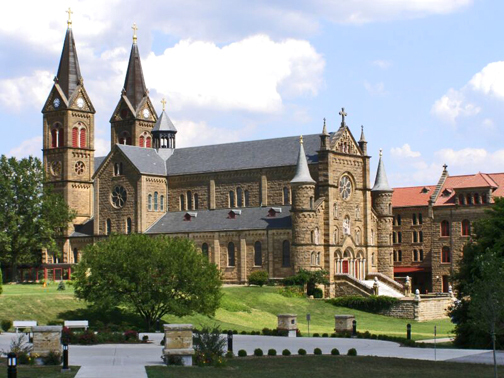 Saint Meinrad Archabbey was founded in 1854 by monks from Einsiedeln Abbey in Switzerland. They came to southern Indiana at the request of a local priest who was seeking help to serve the pastoral needs of the growing German-speaking Catholic population and to prepare local men to be priests. 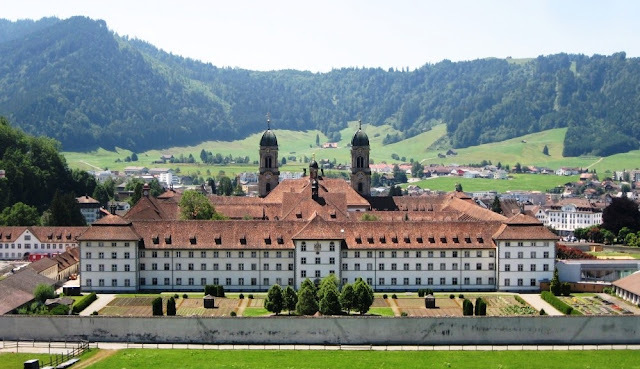 Both of these missions remain part of Saint Meinrad's ministry to the Roman Catholic Church, as Saint Meinrad operates a graduate seminary and school of theology and has more than a score of its monks in parish work, chaplaincies and diocesan assignments. The Benedictine community at Saint Meinrad consists of about 95 men who dedicate their lives to prayer and work. They gather in community five times each day to pray the Liturgy of the Hours and celebrate Mass. 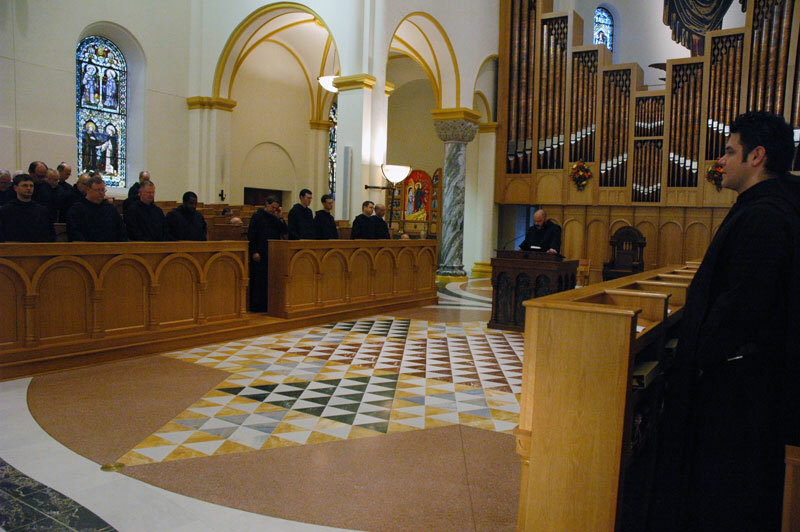 Guests are welcome to join the monks in prayer in the Archabbey Church. The monks live by the wisdom and guidance of the Rule of St. Benedict, the sixth-century instructions for community living written by St. Benedict. A few years after settling in Indiana, the Benedictines began offering high school courses to local youths. In 1861, the monks expanded their general courses to include undergraduate courses in philosophy and theology. Through these programs, the monks of Saint Meinrad began their mission, which continues today: preparing men for service in the Catholic Church as priests. The Seminary and School of Theology now also has education and formation programs for permanent deacons and lay ministers, as well as a summer liturgical leadership program for high school youth and their adult. The great Swiss Abbey of Einsiedeln (Below: Our Lady of Einsiedeln Church exterior front and rear and interior) was built over the tomb of the martyr-monk Saint Meinrad in the year 934. Since Saint Meinrad himself had been part of a group of hermits who lived in the area, the abbey is named after Our Lady of the Hermits. 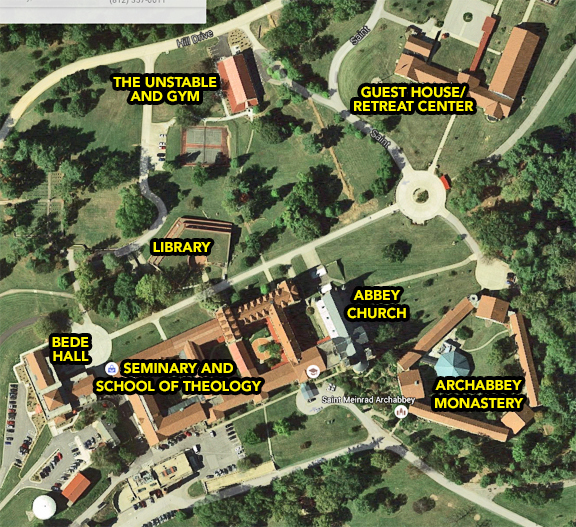 An aerial view of the St. Meinrad complex. Bede Hall, recently renovated, houses the offices, teaching kitchen and St. Simeon's Residences that are part of The Institute for Priests and Presbyterates. The Unstable, located in another recently renovated building, is a beer and pizza "pub" for students, faculty and visitors. There's is also a large gym in the building. The newly renovated abbey church with pipe organ, monks choir stalls and altar. The monks sing the psalms antiphonally from side to side. On special feasts and holy days, the monks process in from the monastery to their places in the choir stalls. Typically, the come in in seniority according to when they became members of the community. - youngest first and oldest last. This ornate room is called the Chapter Room. This is where the community meets with the monastery leadership (abbot, prior and subprior) to make major decisions, hold meetings and hear lectures. Here they gather five times a day to sing the Liturgy of the Hours (psalms) and celebrate Mass. Some new recruits with their shaved heads called a "carona" meaning crown. They get to let it grow out these days, thank God! Brother James presents his handwritten vow chart to Archbbot Justin. It will be placed on his casket when he dies. Some of the "elders" celebrating their jubilees. This somber procession leads the body of a deceased member of the community from the church to its burial place. Priest or Brother, they are buried in order of death in a simple poplar box with no vault , no flowers and matching headstones. All tombstones are carved from local stone. Abbots and Archabbots are buried on the stone path facing the cross with slightly larger tombstones. They do a beautiful job at their faith-filled funerals. I had the privilege to attend seminary there from 1964-1970 and working there full time from 2005-2015. One of the perks of my job is a casket from their Abbey Caskets business. 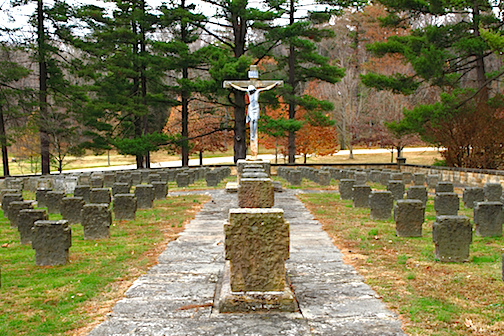 I have chosen to be buried in one just like the one the monks use, in St. Theresa Cemetery, down in my home parish near Rhodelia where I was born. Not too long ago, I was going through some old photographs from my days at the Cathedral of the Assumption. I came across these photos of the insides of the tombs of the bishops in the undercroft. 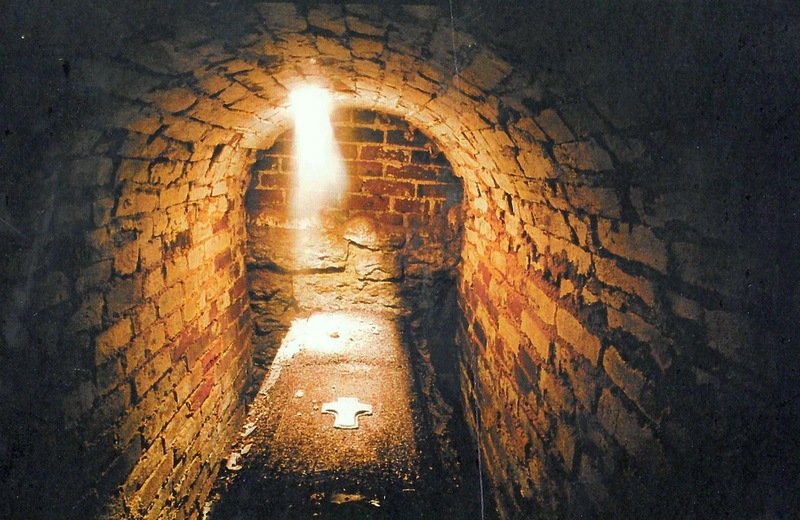 When we were remodeling the area now known as the "Bishops' Chapel," we dropped small cameras into the brick above ground tombs in preparation for preserving them more appropriately without actually disturbing them. 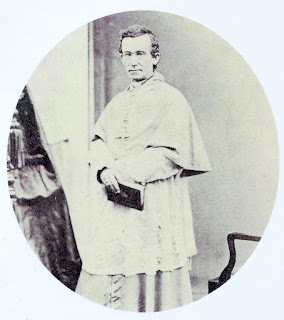 Bishop Charles G. Maloney was concerned that if Bishop Flaget were to be canonized at some future date, it would not be good if the tomb had been disturbed. Here is what the tombs look like on the inside. First Bishop of Bardstown 1808-1832. Bishop Flaget is buried in a simple leather covered casket bowed out at the shoulders. Notice the remains of a wreath or bouquet of flowers at the bottom of the picture. 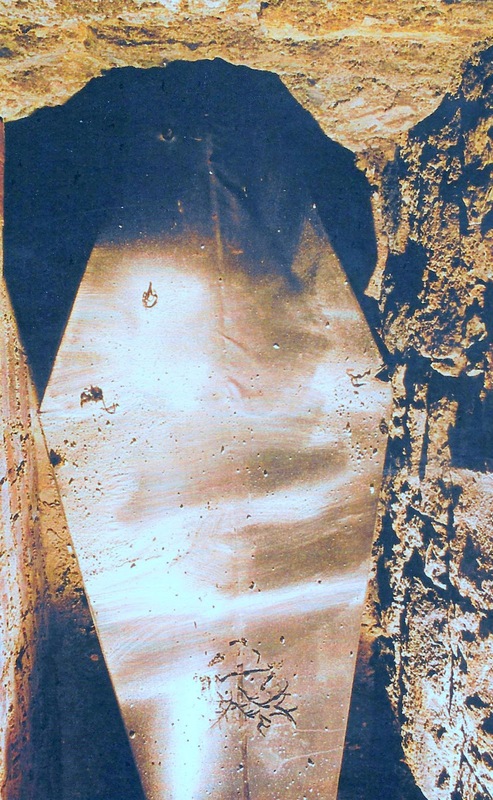 Bishop Lavialle was buried in a cast iron casket after his short two year reign as bishop. You can visit the Bishops' Chapel in the Undercroft of the Cathedral and pray at the tombs of Bishops Flaget and Lavialle. You can also visit the archdiocesan museum across the street from the Cathedral. It has many artifacts from these bishops and many others as well. Our rich history as a diocese is displayed there. It is certainly worth the trip and I highly recommend it. I love this man named Bartimeus! He is a man who knows what he wants and is willing to jump any hurdles in his way to get at it! No wimpishly sitting back and wishing and waiting and whining for what he needs, he is willing to do whatever it takes to get what he needs! No hoping to be noticed! He makes sure he is noticed! Nobody’s “sit down and shut up” is going to stop him! For him it’s “jump up, shout and be sure you’re heard.” His motto might just be Carpe Diem! Seize the day! Grab the moment! He is tired of being blind. He desperately wants to see! He has a burning faith in Jesus and he will not be held back either by his own reluctance or the obstacles others throw in front of him!